Hello everyone! This year my oldest daughter decided she really wanted to start cheerleading. 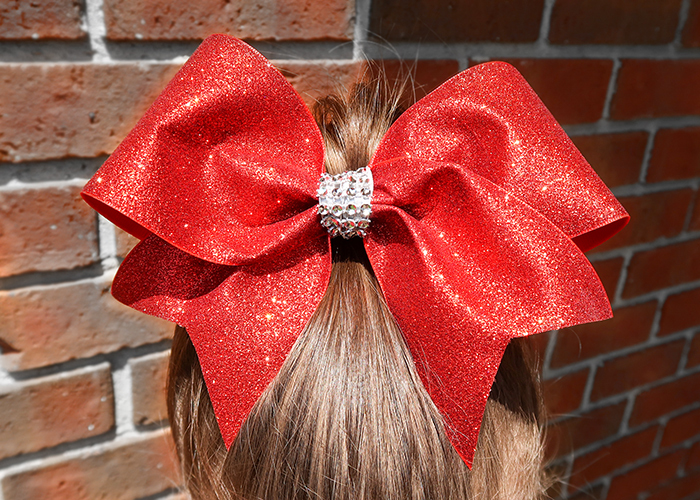 There is a very specific style of hair bow that is used for cheerleading. Her team only provides one bow for performances. I thought it would be a good idea to have a few extras in different styles for practices or other events. 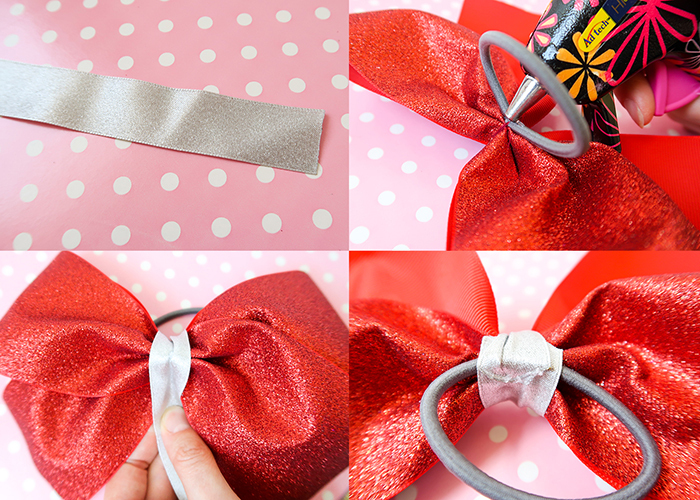 Today I’m going to show you how to make a cheer bow that can easily be customized to match your team colors. 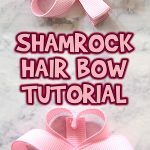 This also different from my other bow tutorials in that I show you how to attach a ponytail holder instead of a standard clip. Standard clips will not stay in place during tumbling moves like backflips, but ponytail holders will! Let’s get started! 3 inch grosgrain ribbon. 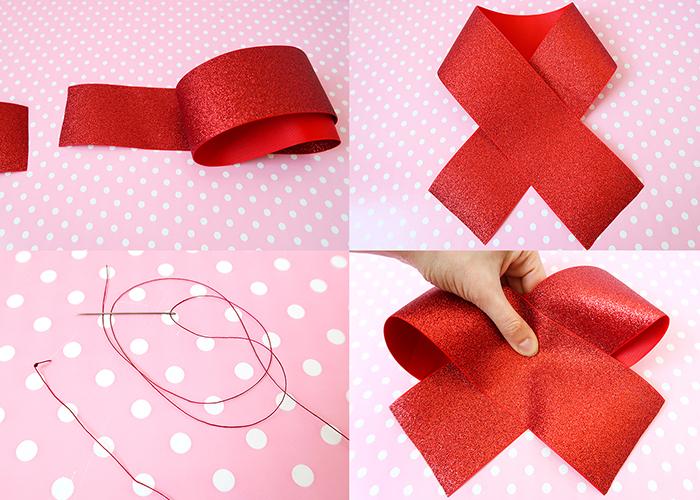 I used red glitter ribbon, and the best place I’ve found for specialty ribbon like this is on Amazon. Make sure it’s grosgrain, because it’s stiff enough to hold it’s shape. 1/2 inch to 7/8 inch ribbon. This is for our center. Optional: Gemstone ribbon, lace, decorative trim, etc. 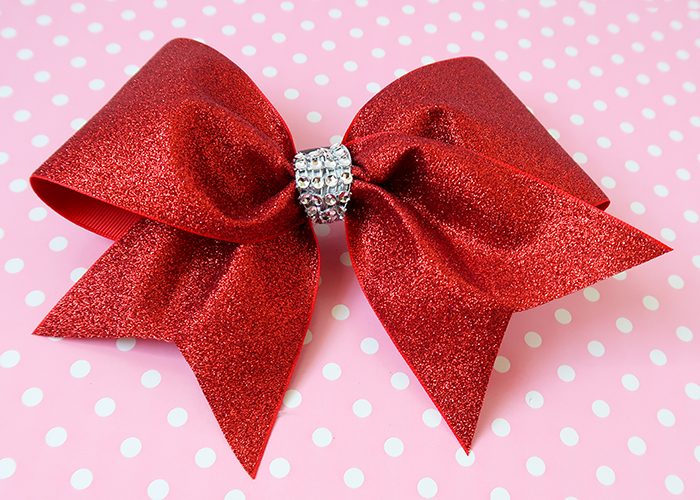 I use flexible rhinestone ribbon to add sparkle to the center of the bow. Ponytail holder. I recommend the metal free style for comfort. Optional: if your ribbon is not sealed by glitter like mine is, make sure to have either some fray check or a lighter handy to seal the ends of your ribbons. 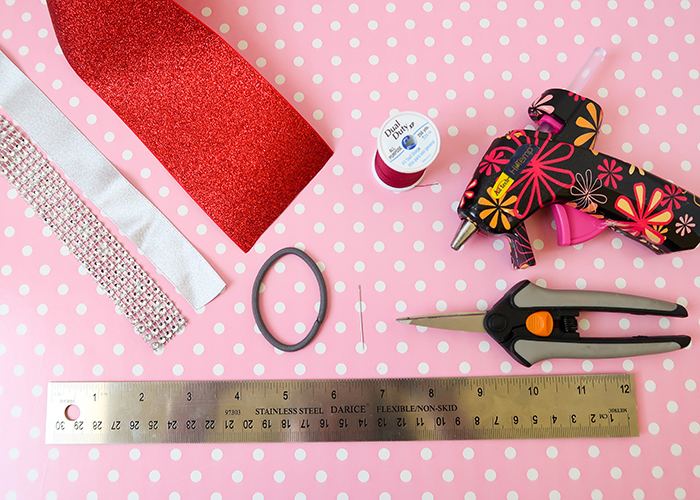 Start by cutting your big ribbon to 25 inches long. Lay it flat with the wrong side up, and then cross over the two ends like shown. It should look like a cause ribbon. Then thread your needle with about 10 inches of thread, we’ll need it in just a minute. Next you’re going to take the back loop of your ribbon and line it up with where it’s crossed in the front. Make sure your front pieces are long enough, as they are going to be the bow tails. 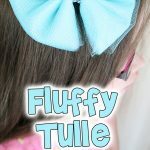 I make my bow tails a little short as my daughter wears her bow in a way that the tails would block her vision if they’re too long, so adjust according to preference. 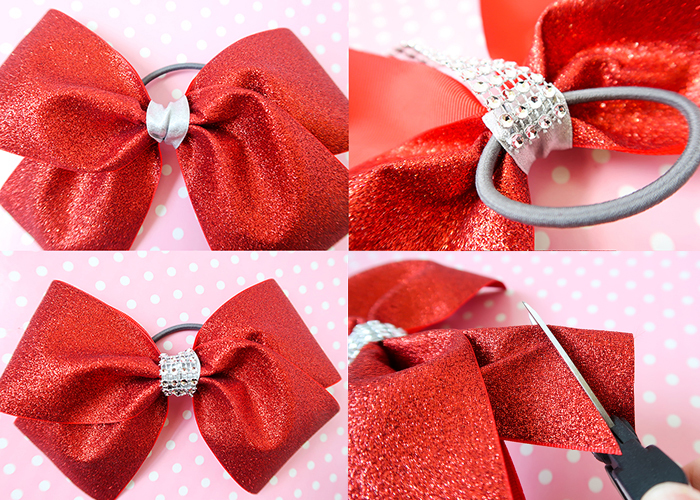 Also make sure that both loops of the ribbon are even and the same size, as these will be the main part of the bow. Insert your needle from the back at the top of where the the back and front cross of the ribbon meet. Pull the needle through, and let it hang for a moment. Use your fingers to bend the bow center into an accordion fold like shown. Play around until it looks pretty to you. Double check to make sure your loops are still even on both sides of that center pinch. Then wrap the thread several times around the center of the bow to secure it, and tie a knot in the back. That’s the hardest part, I promise. 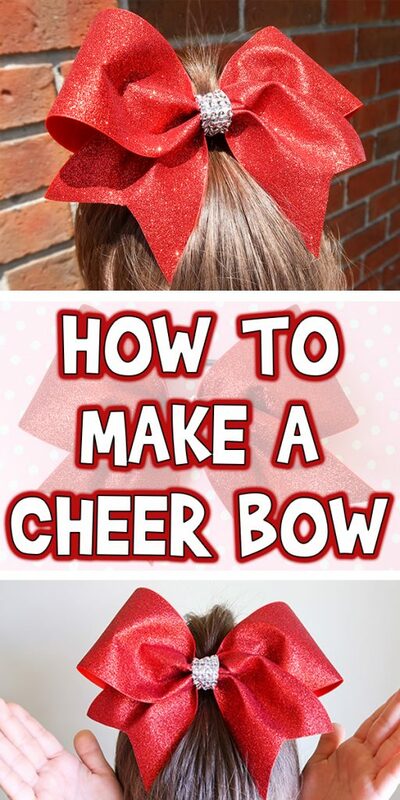 Now you have your basic cheer bow. 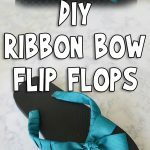 No matter what style of ribbon you choose, if you layer lots of ribbons, or what center you use, you’ll always use this same method to make the base of the bow. 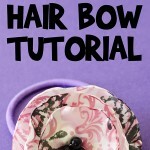 Now put some fresh thread on your needle and sew your ponytail holder onto the back of your bow center. Try to only put the needle through the fabric covering on the ponytail holder, and not through the elastic in the center. 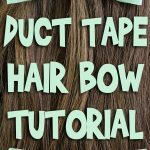 Also wrap the thread several times around the bow center and the ponytail to make sure it’s secure, and then knot it off. Next you’re going to grab the ribbon for your center. Place a dot of hot glue on the center of your ponytail, and place the ribbon end on it. 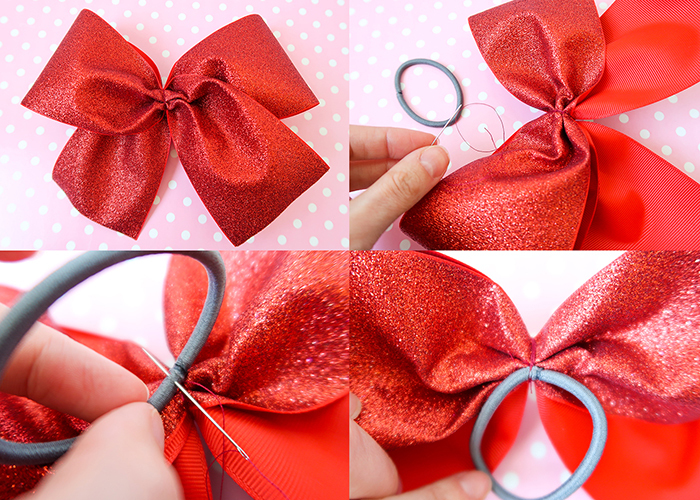 Wrap it around the front of your bow snugly, trim it off, and glue down the end where it overlaps. See how cute? You can leave the center like this, or repeat the exact same steps to add some rhinestone ribbon on top for a little extra sparkle. 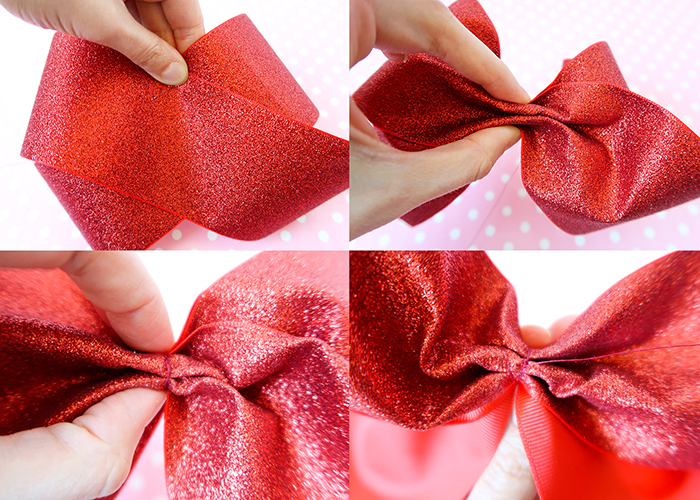 Now fold the ends of your big ribbon in half, and cut them at an angle like shown to make traditional “V” cut ends. Also, seal them with your fray check or a lighter if necessary. And you’re all done!! I absolutely love how this bow turned out. I also love that one of her team colors is red, so I can use this bow at Christmas time too! 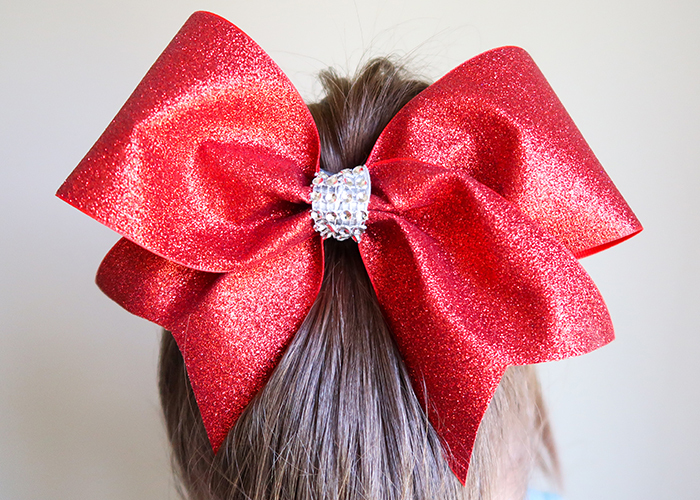 If your girls are in cheerleading, or just love bows, make sure to give this one a try. I just love how it sparkles in the sun! Thanks for learning how to make a cheer bow with me! 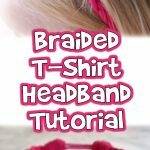 Ages 6-8, Ages 9-12, Find by Age, For Teens, Kid's Crafts, Wearable Crafts	Joanna Brooks	bow, cheer bow, cheerleading, hair accessories, hair bow, sports crafts, tutorial, wearable crafts.